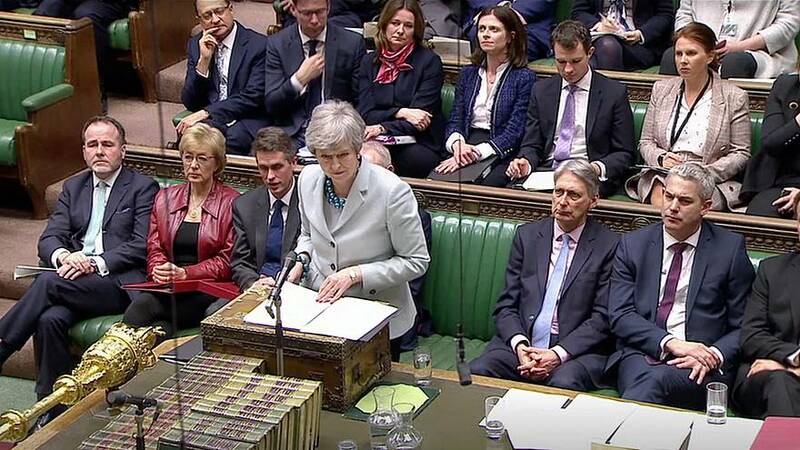 British MPs have inflicted another damaging defeat on Theresa May over Brexit, voting to wrestle control of business in the House of Commons for one day this week. It means that MPs will get a series of "indicative votes" on Wednesday to allow alternative options to the prime minister’s negotiated deal to be considered. However, May has refused to guarantee she will abide by any decisions taken. The government was defeated by a majority of 27 on a cross-party amendment, losing by 329 votes to 302. Three ministers resigned from their posts to vote against the government. It reflects frustration among MPs at Theresa May’s reluctance to examine different solutions. Her own deal, negotiated by London and Brussels and approved by the other 27 EU governments, has failed to gain the parliamentary approval needed for its terms to take effect. Last week the European Council – government leaders from EU member states – granted the UK a two-week reprieve over the Brexit date. The country was due to leave the EU this Friday, March 29. Instead the exit date is now April 12 – if the withdrawal deal is not passed this week. If the deal is approved by the UK parliament this week, the date is pushed back to May 22. The prime minister has said she still hopes to bring her deal back for a third vote. But speaking to the House ahead of the debate, May conceded there is “still not sufficient support” for her EU Withdrawal Deal after it was twice rejected by MPs in historic defeats for the government on a primary piece of legislation. This amendment is approved and calls on the government to "provide sufficient parliamentary time this week" for a series of "indicative votes". This would mean Parliament voting on a series of different alternatives to May's deal such as a second referendum, adopting "Common Market 2.0" or a Norway Plus style deal, a general election or even revoking Article 50 altogether. This amendment is approved and paves the way for "indicative votes" as well but its wording is tougher and would hand control of the Brexit process over to Parliament - allowing MPs to put forward motions to be debated on Wednesday rather than the Government. This amendment is not approved and would have meant if the UK was seven days away from a no-deal Brexit (i.e. by 5 April) the government would have had to allow MPs to vote on whether to leave without a deal or to request another extension from the EU "to give time for Parliament to determine a different approach". What is in Theresa May’s Brexit deal and why is it so unpopular? What is next for May? May is struggling to hang onto her authority among her MPs and was forced to summon many of her top Cabinet ministers along with several high profile members of the Eurosceptic European Research Group (ERG) to her ministerial residence Chequers at the weekend. It followed reports in several British newspapers that MPs were plotting to force May to stand down in favour of a caretaker prime minister such as Cabinet Minister David Lidlington or Environment Secretary Michael Gove who would push Brexit through the Commons. May's chances of survival worsened last week after a televised address on Wednesday suggesting that the delay to Brexit was solely the fault of MPs and that the "tired" British public just wanted to get on with it. She then asked the EU for a short extension to Article 50 against the advice of her ministers and was only granted an extension until 22 May provided she could get her deal through the Commons. But speaking in Parliament today, May said she would not allow the UK to crash out of the EU without a deal unless it was approved by MPs - so a long extension would be inevitable if they did not back it. Labour Leader Jeremy Corbyn said the government's approach to Brexit was "a national embarrassent" and accused May of "recklessness" by asking for a short extension of Article 50 against the advice of her own Cabinet. The Scottish National Party's (SNP) Westminster Leader, Ian Blackford, urged Parliament to "take back control" of the process saying the people were "ashamed" of the government. He asked May to respect the will of Parliament and said if the votes of MPs did not count then her Government would be committing "an assault on democracy". Brexit: which ministers just quit May's government and why?